Enjoy the ultimate in comfort with this chaise wall recliner for your den or living room. Many additional color choices are also available so you can have a look you love. The recliner is constructed using the finest solid Northern Hardwood Frames. Wood is kiln dried, double doweled, glued and corner blocked. The recliner's patented steel reclining mechanisms are number one in the industry. The finest materials available are used for the cushioning. High density urethane foam and bonded dacron fill are standard. What's more, your recliner is crafted with pride and made in the U.S.A. Reclining length is 78 inches. The Handle Recliner Chaise Wall Recliner by Ort Manufacturing at Wayside Furniture in the Akron, Cleveland, Canton, Medina, Youngstown, Ohio area. Product availability may vary. Contact us for the most current availability on this product. Seat Support Sinuous wire seat and back springs are attached with insulated metal clips, unitized fiber covered stake wire and covered with a metal cross-grid permalator. 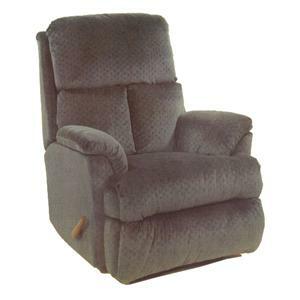 Browse other items in the Handle Recliner collection from Wayside Furniture in the Akron, Cleveland, Canton, Medina, Youngstown, Ohio area.